Located in British Columbia’s lush Okanagan Valley Okanagan lake, The Cove Lakeside Resort is a playground for adults and children with a private beach, pools, hot tubs, gourmet kitchens, fireplaces and private marina. The beautifully appointed suites have splendid views of the lake and surrounding mountains from your private balcony and the landscaped gardens invite exploration. Tucked away in it’s own private cove with Trophy Rainbow Fishing literally at your doorstep, this premier resort is one with a difference….and a memory in the making. All of our packages include water front pick up at The Cove Lakeside Resort in our fully equipped Thunderjet boat. 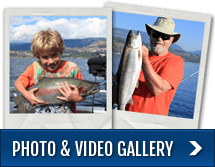 All safety equipment, fishing tackle and a box or shorelunch upon request ($20.00 / per person) Your guide will be a friendly knowledgeable Licensed Fishing Guide. Your comfort and enjoyment comes first when you choose Rodney’s REEL Outdoors fishing charters. Accommodations at The Cove Lakeside Resort. For accommodation costs please contact the hotel at 1.877.762.2683 for availability and best available rates. You may also click here to check online. Box lunch or shorelunch for each day of guided fishing upon request. ($20.00 / per person) When ice fishing all food and drinks for the day are included in the charter cost. All safety and fishing equipment, fully equipped boat and private guide exclusive to your group. Private dock for your safety when fishing Okanagan lake. 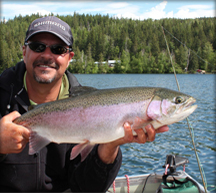 Pick up and return from Cove Lakeside Resort via our truck when fly fishing, Bass fishing ice fishing.